In the middle of the vale there was a steep hill which was called Amon Gwareth, the "Hill of Watching". 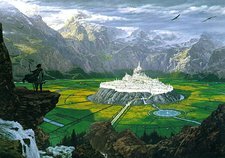 There Turgon decided to found a great city that would be protected by the mountains and hidden from the Dark Lord Morgoth. Turgon and his people built Gondolin in secret. After it was completed, he took with him to dwell in the hidden city his entire people in Nevrast — almost a third of the Ñoldor — as well as nearly three quarters of the northern Sindar. He originally named the city Ondolindë, which is Quenya for "The Rock of the Music of Water" after the springs of Amon Gwareth. The name was later changed to its Sindarin form. The Hidden Way was protected by seven gates, all constantly guarded; the first of wood, then stone, bronze, iron, silver, gold, and steel.